Hello there! If you take a look at my posts lately, they have been around issues of questions in English. 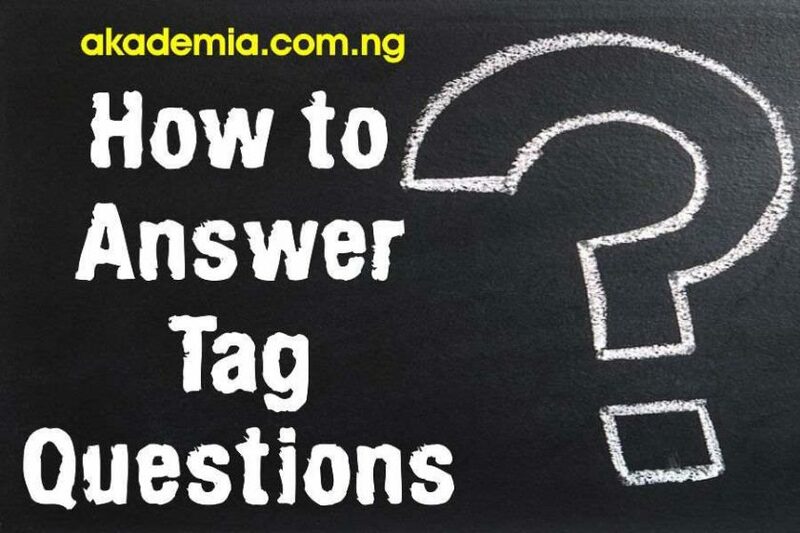 I have discussed Wh Questions, Types of Questions in English, Tag Questions and now following up on Tag Questions, I wish to show you How to Answer Tag Questions with Examples. Many users of English of get it wrong when it comes to answering tag question. So how do we appropriately answer tag questions? Let’s dig in and see, shall we? She is careless, isn’t she? Yes, she is. He shouldn’t be here today, should he? No, he should not. *We are not all stupid, are we? Yes, we aren’t! Remember that any sentence that is asterisked in English is ungrammatical. The above answer is wrong because it is incongruous: positive with a negative. Back to what we said earlier, if you agree with the statement, your answer must reflect the agreement, bearing in mind whether the sentence is positive or negative. A. We are not all stupid, are we? Yes, we are! B. We are not all stupid, are we? No, we aren’t! The sun is the centre of the solar system, isn’t it? Yes, it is. Snow usually falls in Nigeria, doesn’t it? No, it doesn’t! Roses aren’t always red, are they? No, they aren’t. The earth revolves round the sun, doesn’t it? Yes, it does. The earth doesn’t rotate on its axis, does it? Yes, it does. Nigerians don’t like football, do they? Yes, they do! Eagles live underground, don’t they? No, they don’t! Mercury isn’t liquid metal, is it? Yes, it is! The consonant sounds in English aren’t 26, are they? No, they are not. Humans should not live by bread alone, should they? No, they shouldn’t! Do you mind a cup of tea? Do you care for a plate of rice? What most people reply is often the opposite of what they mean. Have you found yourself in such situation before, when you really wanted a cup of tea and you answered ‘Yes, I do’ and you did not get a cup of tea? How awkward! In another vein, has someone asked you if you cared for a plate of rice and you said ‘No, I don’t’ and the individual passed the plate of rice over you? How did you feel? You felt the individual did not understand simple English; Poor you! It was you who gave the wrong answer! Given the foregoing, do you mind if I give you a thousand dollars? If you don’t, then send this post to or share with a thousand people and a thousand dollars will be in your account! Don’t ask me how that will be! Do it first. However, if you do mind getting a thousand dollars, then tell someone else to share this post with a thousand people and a thousand dollars will be in their accounts! ‘Awesome’! Did I hear you say? Unlike ‘do you mind question’ if you care for something, it means you want it and you are saying: ‘yes, give it to me!’ On the other hand, if you do not want it, you simply respond: ‘no, I don’t care’. Are you confused? No, you are not! Am I sure? Yes I am! Will you share this post? Yes you will! Is it possible to ask questions or send in my comments? Yes, of course, it is! See you around! How many types are there in question tags ? There are specific numbers of types. The nature of the sentence determines the type of question we ask. For sentences or statements with auxiliary verbs, the verbs determine the tag. For sentences without auxiliary verbs, the non-modal auxiliary, DO comes handy.